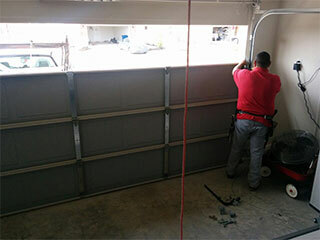 We pride ourselves in being one of the most customer-focused garage door service providers that residents in San Mateo can reach out to for professional assistance. If your garage door isn’t opening like it should, or keeps malfunctioning from time to time, give us a call. Our technicians have been operating in this field for many years, and are extremely skilled in solving problems of every type and size. If you find that your door is refusing to close for some inexplicable reason, it could be that your safety sensors have become misaligned. They could be falsely detecting an obstacle, and are preventing your door from closing to prevent it from damaging it. If this is the case, you will need a professional to realign the sensors for you. These components are very delicate and must be handled carefully. If your garage door spring suddenly snaps, professional assistance is not optional, it's a MUST. These components are extremely dangerous to handle with the proper tools and the necessary training. What's more, there is a danger your door will come crashing down unexpectedly if you try to operate it while the spring is broken. Our experts can safely replace the damaged spring and restore your system's operation in no time. If your tracks have become dented, your door can simply stop moving. Again, this is something a professional will have to fix. We'll be able to advise you regarding whether a repair or replacement is required. Whatever the best course of action is, that's the one we'll adhere to. If you are experiencing problems with your garage door or simply have not had it looked at for a while, we strongly recommend you get in touch with our experts at Garage Door Repair San Mateo. We can help troubleshoot the issues you are having and guarantee a comprehensive and reliable service.